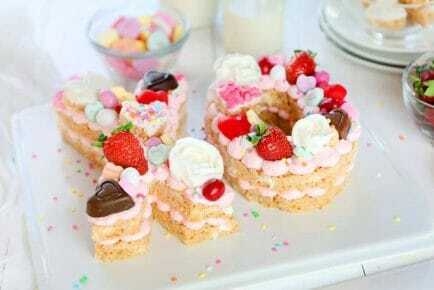 Creating a fun cupcake cake is not only easy but delicious. 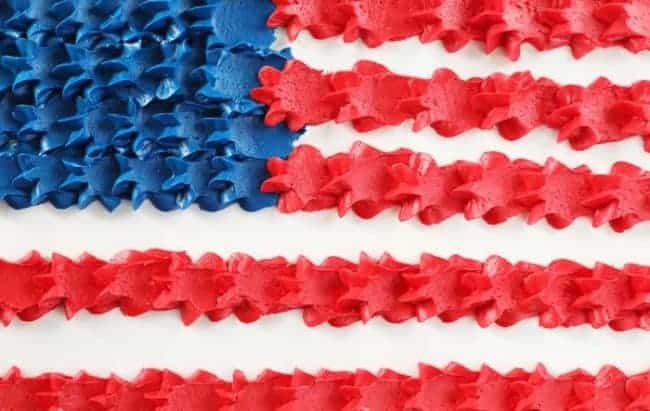 These flag cupcake pull-apart cakes are the perfect way to cheer for Team USA! I tried to simplify this cupcake cake as much as possible, wanting to make sure the baking and the decorating could be done in a reasonable amount of time. I specifically make my cupcake cakes with 24 cupcakes in each, which is the standard yield for most recipes. 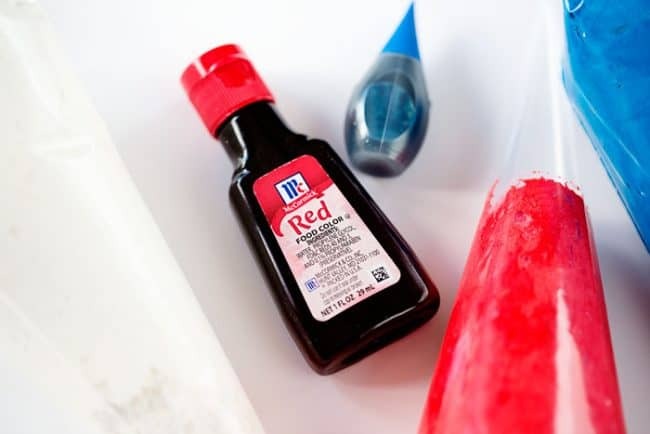 I used McCormick food color because it is easily available to anyone who can get to a grocery store! And I limited my decorating tips to just a few so you would not need to do the extra shopping. Add white frosting to a piping bag fitted with a 2D tip. Pipe white rosettes on the last 3 cupcakes in the top row then across the entire 3rd row. Pipe red rosettes on the last 3 cupcakes in the 2nd row then across the entire bottom row. Pipe blue rosettes on the first three cupcakes on the 1st and 2nd row. Prepare buttercream and divide in half. Leave one of the halves white. Divide the other half in two, then tint one red and one blue. 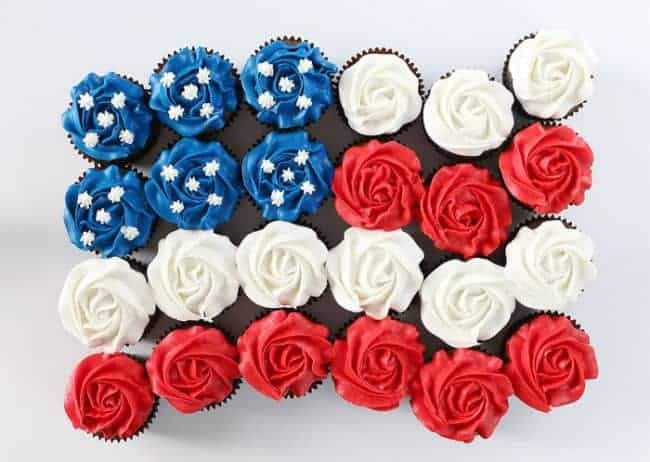 Lay out your cooled cupcakes in the shape of a flag. Using an ice cream scoop, scoop vanilla frosting onto each cupcake. This is a LOT of frosting, but necessary when you are spreading it around and filling in the gaps between each cupcake. Use a ruler or bench scraper to create guidelines in the cupcake cake so you know where to pipe. There should be a gap between the lines so that white frosting shows between. Using the #827 tip, pipe a red star in the lower left-hand corner of the cake. Take your large offset spatula and swipe down and away from the star. Repeat this along each guideline you have created. 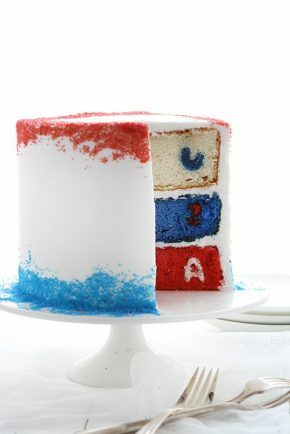 For the blue portion of the cake, your piping will be done right next to each other leaving no gaps between the stars. You will pipe blue in the upper lefthand corner only. I kept a paper towel next to me and wiped the offset spatula off as often as needed. Inspired by Erin Bakes Buttercream Stars and Strips Flag Cake. If it’s at all possible to plan ahead, make your icing a day or two in advance. The color will deepen considerably as it sets. The ratio I use is a 1-ounce bottle of McCormick red food color in about 4 cups of vanilla buttercream. I make the frosting as directed and add the food color when I add the vanilla. 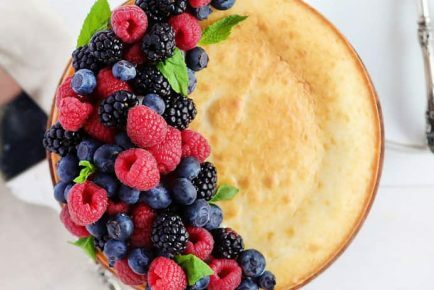 Make sure it is fully incorporated, scraping the sides of the bowl as needed. I will then dampen a towel and set it over the bowl for a few hours. If the red looks perfect after a few hours I will place in an airtight container and store until needed or place in pastry bags and seal until needed. If the color doesn’t seem red enough I will add more food color 1/2 teaspoon at a time allowing it to set for a few hours between each addition. If you have the time to let the frosting rest overnight you will see that it darkens considerably and you often do not need any more food color! 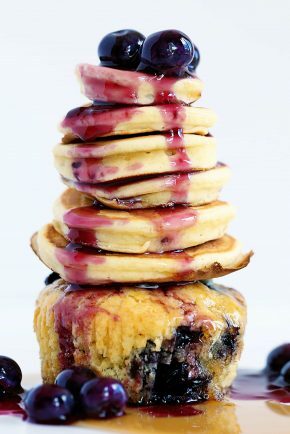 If you had to add extra food color in you may notice a slight difference in taste. Feel free to add a bit more vanilla extract. The exact same principles apply to making bright blue buttercream. Check out how I make Red Velvet Buttercream here! Creating Cupcake Flags is fun and quite easy to do! Just be sure you have enough frosting on hand and have laid out your pattern ahead of time so you know exactly how many cupcakes you will need. 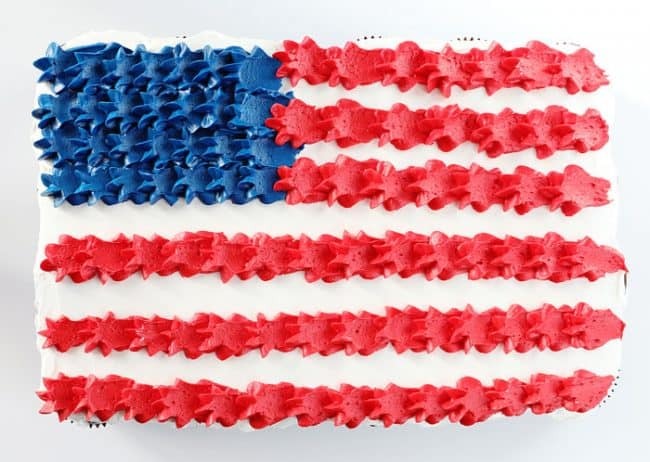 You can, of course, use these for any July 4th celebration or Memorial Day! Thank you so much for supporting the brands that support iambaker! It is my great pleasure to work with McCormick and share their amazing products with you. Check them out on Facebook, Pinterest, and Instagram. 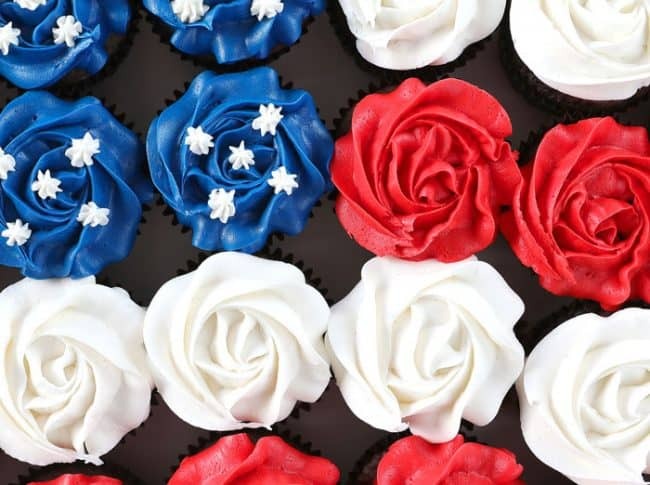 I hope you enjoy these patriotic Cupcake Cake Ideas! 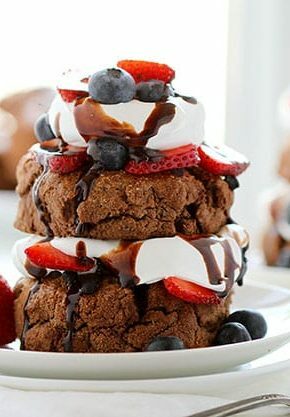 It looks great..I’ll surely try it. Thanks for sharing! 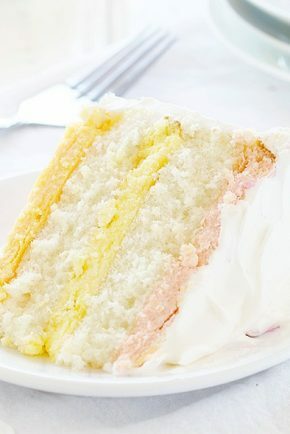 On the one hand you say make a double batch of buttercream and divide for colors and white. It then for the true red frosting you’re saying add the food color when you add the vanilla. So which is it? Could i please have the reicpe for your Buttercream?